Oh, Happy day! 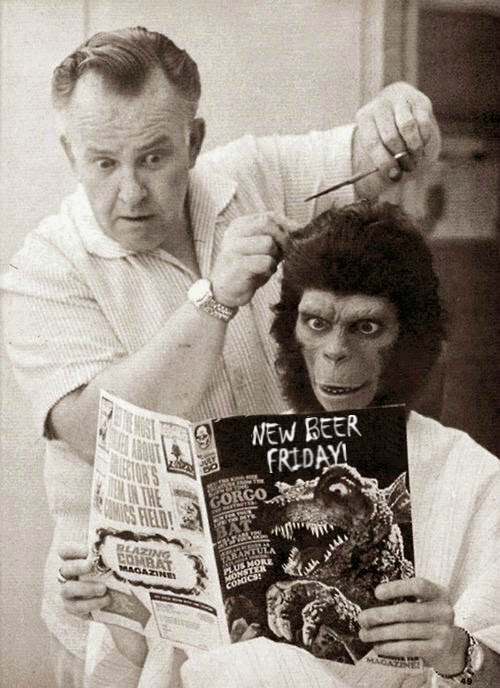 Not only is it New Beer Friday but it's also New Brewery Friday! Kiitos Brewing finally has beer available for you today. They will debut with three beers; a pale ale, amber and blonde ale. Look for some higher gravity beers towards the end of the year. Congrats guys on helping to make a better brewtah! 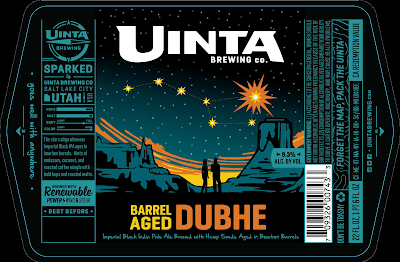 Uinta Barrel Aged Dubhe: The aroma is boozy bourbon with vanilla, chocolate and piney hops. The tastes is dark chocolate, vanilla, toffee like malt and big whiskey running throughout. This is defiantly not the Dubhe your familiar with. Aged six months in Buffalo Trace barrels. It says, 9.3% on the label but tastes much bigger. Available at Uinta starting today - two bottle limit. Uinta Grapefruit Hop Nosh: A big fresh grapefruit nose. The taste starts with a sweet backdrop of malt with added grapefruit puree, grapefruit rind and hop derived grapefruit flavors playing off one another. The interactions of the various grapefruit elements make this a very tasty beer. A little less pithy than it's tangerine brother. 7.3% ABV. Available at Uinta today. Kiitos Amber Ale: The aroma has some light hints of caramel. The taste is toasty and brings back the caramel really strong while adding a decent yet subtle flavoring of hops. A very nice crisp aftertaste adds to this. The palate is about a light to medium with nothing harsh on the tongue, and is very sessionable and clean. 4.0% ABV. Should be popping up at some of the better beer bars around town and will be in Harmons and Maverik stores by Oct 3rd. Kiitos Blonde Ale: Clear golden color, with a decent white head that fades into a thin ring. Malt forward on the nose. Quite a bit of sweetness, with a light body and an almost leafy dryness and a touch of pleasant, spicy hop bitterness on the finish. 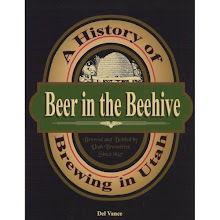 Should be popping up at some of the better beer bars around town and will be in Harmons and Maverik stores by Oct 3rd. Kiitos Pale Ale: Pours orange amber. The aroma is subtle and sweet of floral and pine notes. The taste is malt forward but light as expected from a session pale ale. The hops primarily shine at the end creating a toasty pine finish. The mouthfeel Feel is unsticky and crisp. 4.0% ABV. Available at Liberty Taphouse and Big Willy's. Strap Tank LopLop: I've not tried this one yet, it's described as a more full-bodied than version of their Sgt. Holtz Stout. The play of Belgian yeast and specialty malt brings forth notes of fig-like sweetness, vanilla, cherry and smoke. 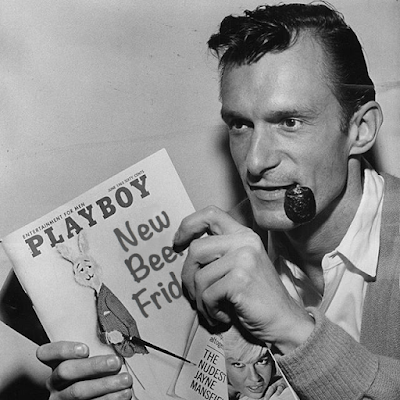 Named after avant-garde painter Max Ernst's. 4.0% ABV. Available at Strap Tank. Boulevard Love Child #8: I haven't had this one yet either. This is always a great wild ale that changes a little bit every year. It's generally quite tart and on the high side alcohol wise. I saw it a Beer Bar. 8.2% ABV. Don't forget that you have the 4th West Oktoberfest this Saturday and Sunday. 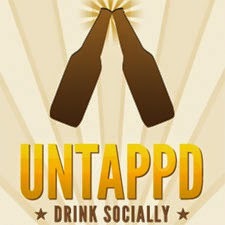 It's hosted by Red rock Brewing and Mountain West Hard Cider. Also, happening Saturday is the 5th Annual Boho Fest. Both will be offering food and music along with great German beers and cider. 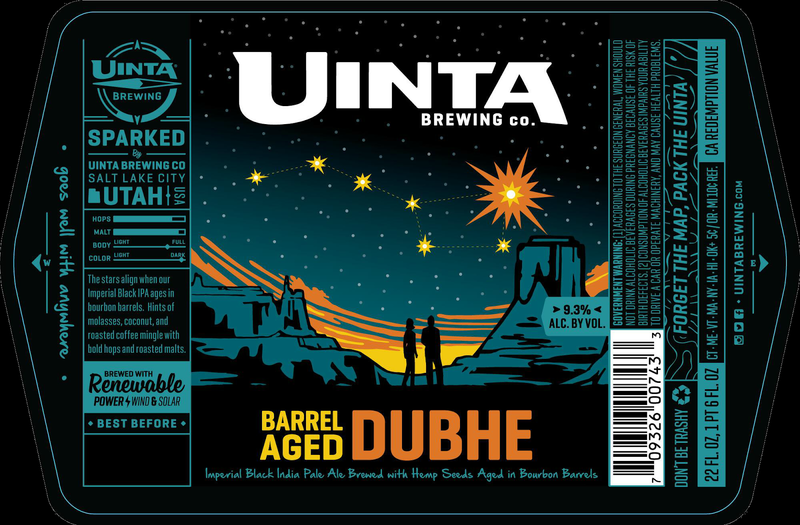 Back in April I told you all about some very exciting beer news, in regards to Uinta's Dubhe Imperial Black IPA. Basically, it was getting the bourbon barrel treatment. After all of this time it's finally coming out of its long spring and summer slumber and it will be ready to put in your favorite glass this Friday (9/29/17). It will be available at the brewery in 22 ounce bombers. I hope to have some tasting notes for you before it's release. 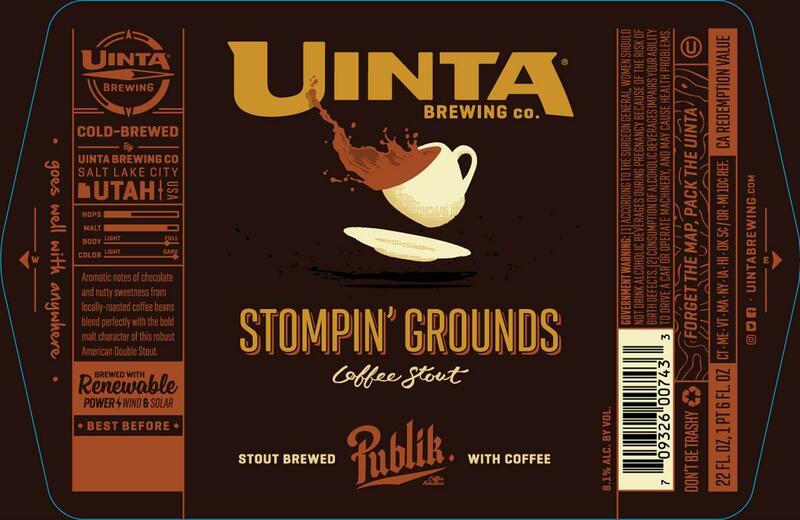 After a year hiatus Uinta's Stomping Grounds Coffee Stout is set to return in the coming months. 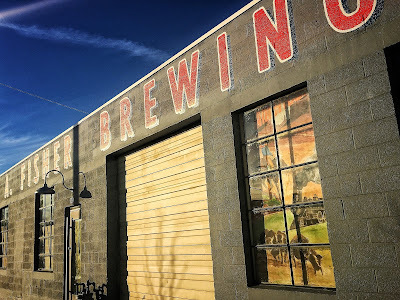 The coffee stout (made with SLC's Publik Coffee) was originally released in December of 2015 in a limited run. The base beer is an American Double Stout, so it's a little more hoppy but not as sweet as a Russian Imperial. The focus will be on the coffee just like the last batch, so if coffee is thing your about to be very happy. 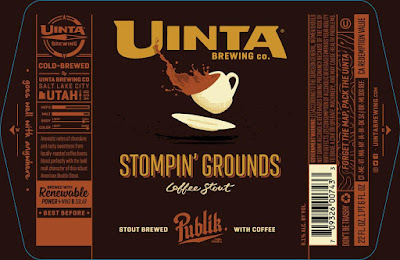 When Uinta released it last time it was a December release, though it could come earlier. You'll notice the label has undergone a makeover as well. Stay close, more coffee/beer news coming tomorrow. Shades of Pale - Peach Berliner Weisse: This debuts tomorrow [9/23]. Look for a lemony tartness with a bit of peach sweetness for balance. 4.0% ABV. Available at Shades of Pale. Baja - Cabotella Mexican Ale: I haven't had this yet. It's an American Blonde Ale, so look for a taste similar to subtly hopped Frosted Flakes. 5.5% ABV. Available at DABC locations. Green Flash - GFB Blonde: I haven't had this yet. It's an American Blonde Ale as well. Described as having more citrus-like hops. 4.8% ABV. Available at DABC locations. New Belgium Fat Tire Belgian White: I guess Fat Tire is no longer just an Amber Ale, it is now a rotating series of beers from New Belgium Brewing. This newest version is a Belgian Witbier. I haven't had it yet. Look for wheat base with orange peel and spices. 5.2% ABV. Available at DABC locations. Proper - My Name is a Killing Wheat Red Hefeweizen: In this tribute to David Lynch's Dune, Proper Brewing brings you a Hefe with lots of wheat crackers with a good amount of floral hops. minimal yeast phenolics. 4.0% ABV. Proper - Grow Wild Gruit: Sage dominates the nose. Mint on the palate and yarrow for bitterness. 4.0% ABV. Available at Proper. Fisher - Spud Suds: Knowing Fisher's innovative style, you'd think this beer has potatoes in it for sure. Nope. It's called Spud Suds because it's made with malt and hops from our neighbors to the north in Idaho. 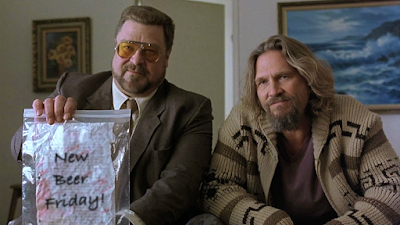 It's a simple American Pale Ale caramel malts with citrusy and floral hops. Tasty stuff. 4.0% ABV. Available at Fisher Brewing. This October is Breast Cancer Awareness Month. Squatters Craft Beers is producing a special limited edition pink Hop Rising can to not only draw awareness to breast cancer but it's a opportunity for you to contribute to breast cancer research while enjoying a damn tasty Double IPA. 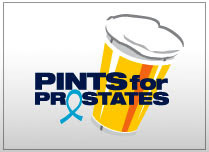 Look, you're going to be enjoying beer anyway, why not do it for a good cause. 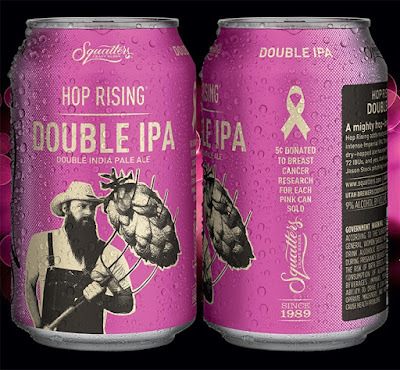 The cans will start appearing in the next week or so - at Squatters/Wasatch locations and DABC stores. Now you have an extra reason to feel good about drinking craft beer! The Holidays have come early this year and there are presents already under the tree. 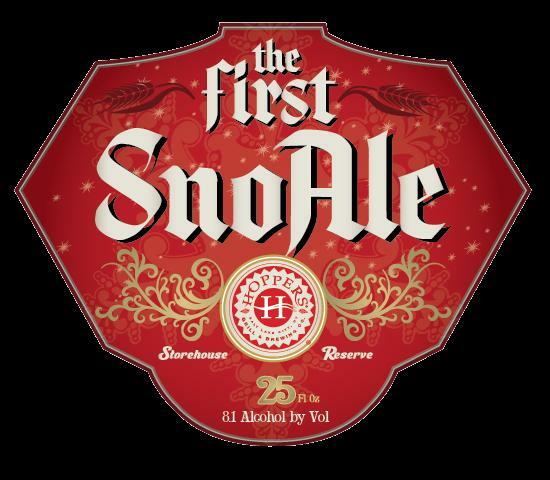 After a seven year hiatus, Hoppers Brewing Company is bringing back their First SnoAle. Part of Hoppers' Storehouse Series, this beer was designed to merge the malt flavor and complexity of a French Bier de Garde Noel and accent it with purely yeast driven spiciness similar to a Saison. Head Brewer and Secret Agent, Donovan Steele says, by using a special blend of French Ale yeast strains, this ale will produced some rich malt flavors and a soft drying finish. From experience, as this ale warms it becomes more peppery in flavor with the complexity of the more prominent grains. Then comes citrus, fig and a fruitiness. It also has a good dosing of Belgian candy sugar to fortify the brew. Wheat and raw oats lend a dry crisp finish. 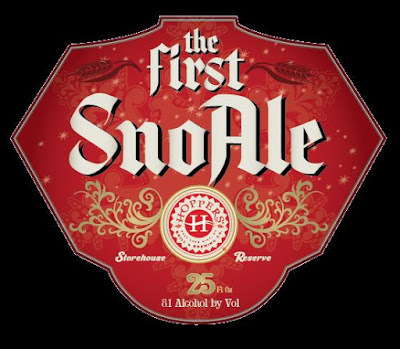 The First SnoAle has an ABV of 8.1% and will be available in 25 oz bottles. It is for sale right now. Only 1100 bottles were produced this year. If you missed this phenomenal ale its first time around, you owe it to yourself to get on this one asap. Only available at the brewpub and don't forget to stash a few away for the real holidays. Two very different local beers from three breweries to help get your weekend started. Confused? Don't be. 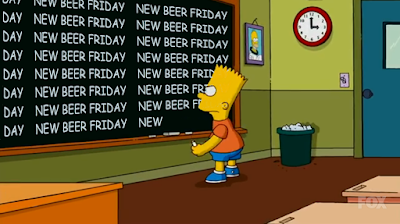 It's just another New Beer Friday. Fisher/RoHa Collaboration - RoFish Wet-hopped IPA: This is the first collaboration between these two new 2017 breweries. 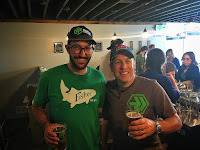 Chris Haas of RoHa and Colby Frazier of Fisher have had a long friendship that dates back to their time brewing togther at Desert Edge. This Wet-hop beer has a great hoppy nose that reminds me of citrus zest and pine. The flavor is the same, nice hop profile... Perhaps a little grassy as it warms. There's just enough pale malt to balance it all out. Very drinkable session IPA. 4.0% ABV. Available at Fisher Brewing and the RoHa Brewing Project today. 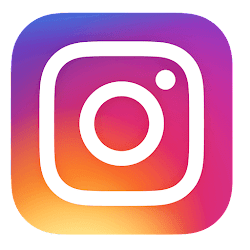 Is there something you found that I may have missed? Please share! 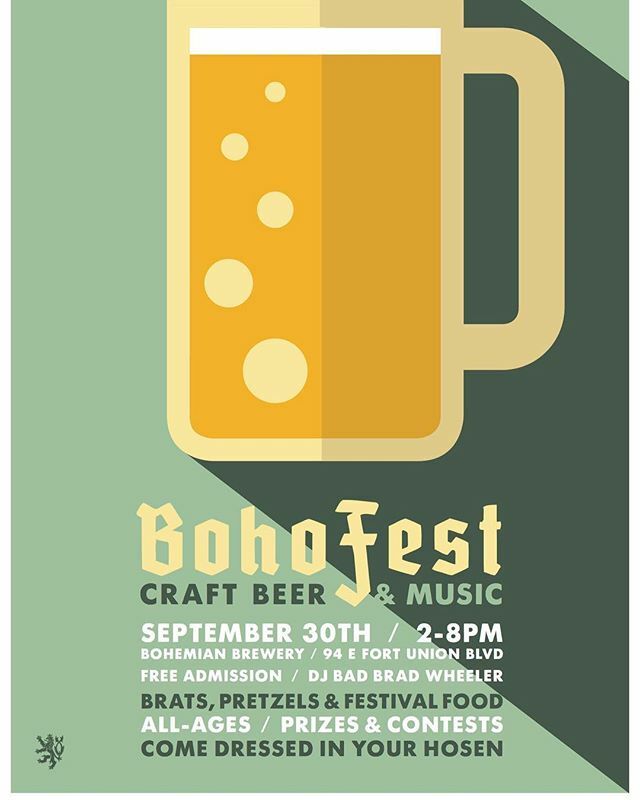 Join the Bohemian Crew for their 5th Annual BohoFest, September 30th from 2-8pm. The party happens at the brewery (94 e. 7200 s.) in the back parking lot. There will be a ton of food, fun and games for the entire family and of course a shload of brilliant Bohemian Beers for adults over 21. 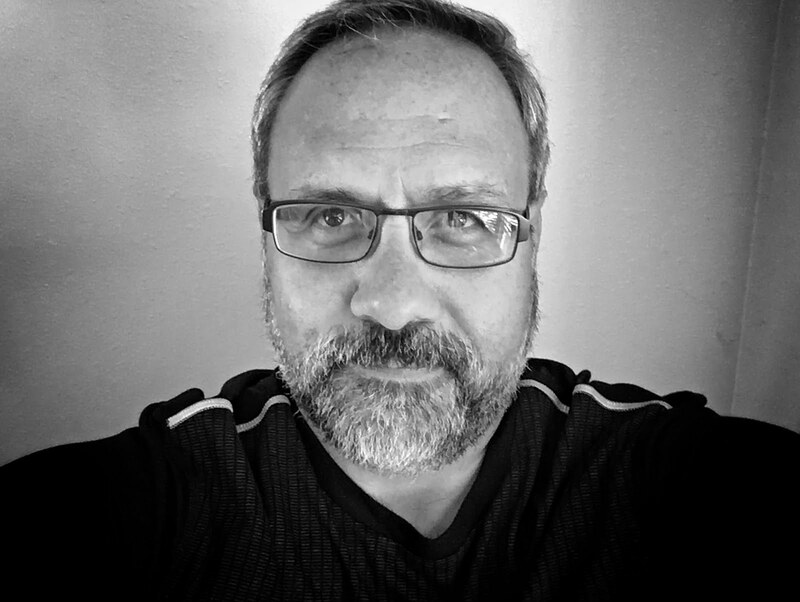 Bad Brad Wheeler will be spinning an eclectic mix of Polka and Party Tunes as y'all get jiggy in your Dirndls and Lederhosen! I hope to see you there. By now School is in full swing, if you're a student of drinking age your probably gunna need some New Beer Friday suds to help you in your end of the week decompression. Go Utes! Shades of Pale - Sweet Dreams: I haven't had this yet. Debuts today at SOP. 8% ABV. Talisman - Udder Chaos: The nose has roasted malt and cocoa powder. The taste has deep roasted chocolate malt flavor, nicely bitter and isn't overly sweet. There is some sweetness in the middle before a lingering bitter finish that is part black coffee and roasted malt. Made with Park City's Ritual Chocolate. 4.0% ABV. Available at Talisman Brewery, Soon to Grocery and C-stores. Brewery Ommegang - Pale Sour Ale: The nose is tart with minerals and lemon. The flavor starts with malt, not quite grainy, maybe more cereal-like. The beer itself is more tart than sour. Cherry and lemon notes appear and there's some grassiness as well. Not super complex but very drinkable. 6.9% ABV. Available at select DABC Stores, Kimball Junction for sure. Ballast Point - Bonito: The nose is malty sweet, lightly citrus and grassy. The flavor follows with more depth. It's subtly sweet with a touch of fruity lime-like citrus upfront. Median bitterness across the middle, and then followed by a dry grassy finish. 4.5% ABV. Available at select DABC Stores, Kimball Junction for sure. Stone - 21st Anniversary Hail To the Hop Thief: A nice aroma of light citrus fruit, malt, and pine. The taste is kinda old school IPA meets West Coast IPA. There's a bit of malt with a good dose of pine, citrus fruit and a bit of lemon as well. A nice, well-balanced DIPA. 9.8% ABV. Available at the Beerhive, Slackwater. Beavertown / Garage Project / Stone - Fruitallica: The nose here has vague hops and fruit. No habanero notes at all. The same goes for the taste. No spice, heat or peppers. It relies on the the tropical fruits (yuzu and kiwi) to carry it. It's not a bad fruited IPA, but I was expecting a little more pepper snap. 8.0% ABV. Available at the Beerhive, Slackwater. Fisher - Oyster Stout: This is much like their standard stout. Don't worry, it doesn't have "the worlds first great taste of fish"! ~ Monty Python. 4.0% ABV. At Fisher Brewing. Great Divide - Hoss: This is a typical Märzen style lager. It's full of vanilla like caramel malts but it's more aggressively bittered with spicy and floral hops. 6.2% ABV. At the Beer Bar. Sierra Nevada - Ovila White Ale: A great example of the style. A good dose of wheat and coriander with spicy notes from the yeast. Very nice. 5.3% ABV. At Beer Bar. Goose Island - Sofie: Soft malts, clove and Belgian yeast. There's a slight peachy tartness in the back end. Quite nice. 6.5% ABV At Beer Bar, BeerHive. When I started out on my beer nerd adventure many moons ago, one of my favorite mentors was Jennifer Talley. She was the former head brewer at Squatters during an important time in my beer life. She taught me a lot about beer while providing an ocean of well crafted pints to learn from. Jennifer's knowledge of session beers earned she and Squatters a lot of praise during her time in Salt Lake City. Even though she's no longer in Utah and shackled with restrictions here commitment to brewing session strength beers remains strong. Jennifer has penned a new book, about a subject we in Utah know all too well. 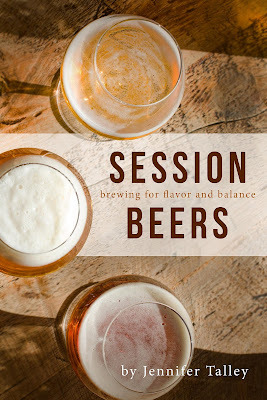 In her new book, Session Beers: Brewing for Flavor and Balance Jennifer lays out the history and techniques of some of the most comfortable beers on the planet that adhere to high quality standards and are dedicated to balance and drinkability above all. In Jennifer's words, beers were “sessionable” long before that word was coined, but brewers have reinvented traditionally stronger classic beer styles to make them, too, well-suited to casual drinking sessions. 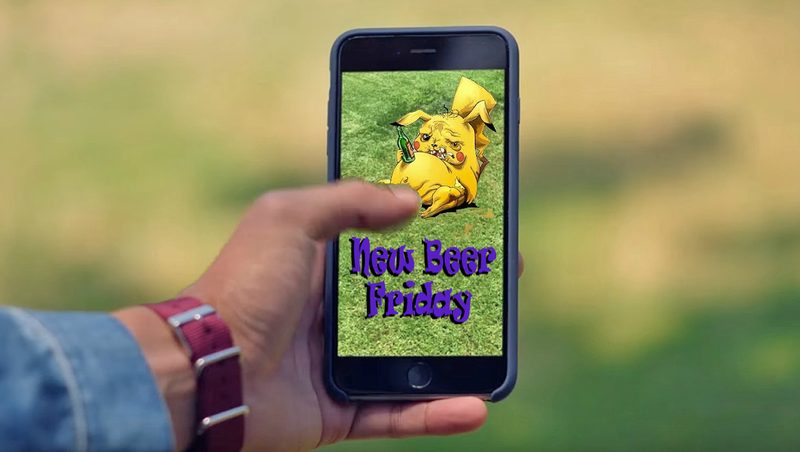 Responsible consumption of these high-quality, easy-drinking beers gives beer lovers the freedom to celebrate community and friendship while consuming less alcohol. Jennifer is currently the Head of Brewery Development at Auburn Alehouse and has also brewed at Redhook and Russian River. Welcome to September. You can officially start drink those autumn beers with out feeling guilty. Our New Beer Friday selections today cover a wide range of flavors. Please enjoy.